Serving all of Houston and the surrounding areas! Sealy - Katy - Conroe - The Woodlands - Humble - Baytown - Clearlake - Galveston - Needville - Rosenberg - And everywhere else, too! According to the buzz in southwest Houston, a large colony of bees that previously made a vacant house their headquarters moved across the street to a resident’s house. The more the bees began to migrate toward occupied houses, the more they posed a threat to the residents there. From loudness to preventing people from getting in and out of their houses, these dangerous Africanized bees were everywhere in this neighborhood, stinging residents, their children, and their pets. The swarm expanded and the bees started creating hives on other nearby neighborhood houses, much to the dismay of the residents. Something needed to be done about these bees, and we were called to the scene to investigate and exterminate them. You can read the full news article here. There are several companies that now offer live bee removal however I have been getting calls from many people telling what they did when they came out and it seems there are a lot of scams in this field. Some companies have been vacuuming the bees up in an effort to make it look as if they are safely removing them. But the bees get killed in the vacuum! The only way to safely vaccum bees is to baffle the vaccum so it has very little suction. The problem is that doing it this way would take all day to pick up all the bees and is not efficient in doing business. To the uneducated homeowner it looks like they just sucked up the bees and are now going to put them in a new home but if you looked inside the vacuum you would see thousands of crushed bees. I get lots of calls saying the bees have been there about three weeks. Three weeks of work can results in a lot of comb in a wall but in most cases what you see in this picture is what you would have in 2-3 weeks. 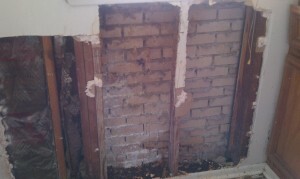 Here is a removal done in Katy Texas. The bees were under the floor. We pulled out over three trash barrels of honey and comb from this house. It was not possible to save these bees as they were very aggressive and in a place where they could not be removed without crushing the combs and bees in the process of getting it out. 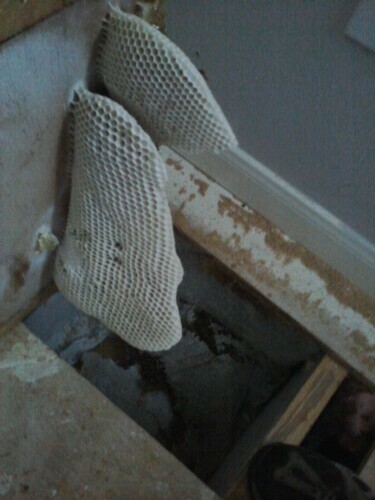 houston bee removal, removing the honey comb. If the bees have been in the location for more than a few months then it is best to remove the honey comb to avoid future problems. We have various ways of doing this without tearing up your house. In some cases we do have to go through drywall which then requires replacing it and in others we can safely remove the comb and bees with little or no damage to the property. Bees in Houston have been a long standing problem with home owners and business’s. Bees in between the fist and second floor. This is one of the most common places that bees will infest in a house. 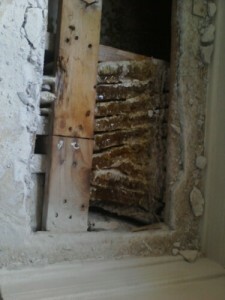 They like to get in between the floor joists where they have adequate apse to build a home and easy access to get out. 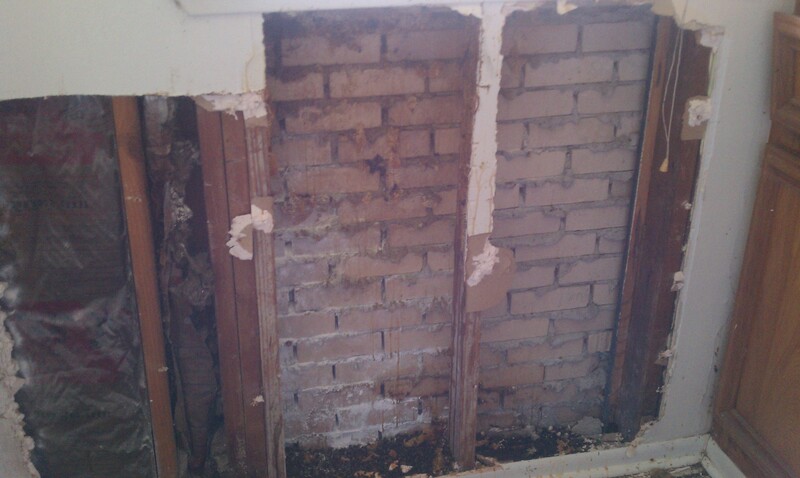 In this house which was brick we removed the bees but did not remove the comb. The bees had been there for two weeks so there was little honey comb to remove and wasnt worth damaging the house to remove it. The crack in the brick was sealed with new mortar and a new swarm of bees will not be able to get into this location in the future. In most cases people just want the bees gone and don’t want to spend hundreds of dollars to do so. We can exterminate the bees and in most cases this is all that is needed. Of course if it’s a swarm and can be captured then we will do that rather than exterminate. Complete removal. In some cases if the bees have been there for years it may be best to remove the bees and then cut out the wall or floor and clean out the honey comb. I try to put everything back as it was but in some cases I may have to bring in a handy man who can put back to the way it was, or you can arrange this if you have someone you like to work with. ©2019 Budget Bee Control. All Rights Reserved. Website Design, Development and Hosting by GreatCircle Studios.